Storytellers who make mythology accessible are living treasures. 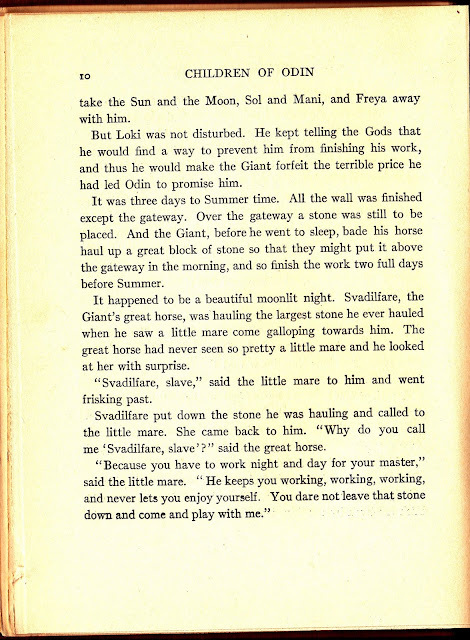 Back when I headed Children's Services at Mount Clemens Public Library, middle schoolers annually had a Greek mythology unit. I loved overhearing how their teacher made it as alive as a "soap opera" and without modernizing it. 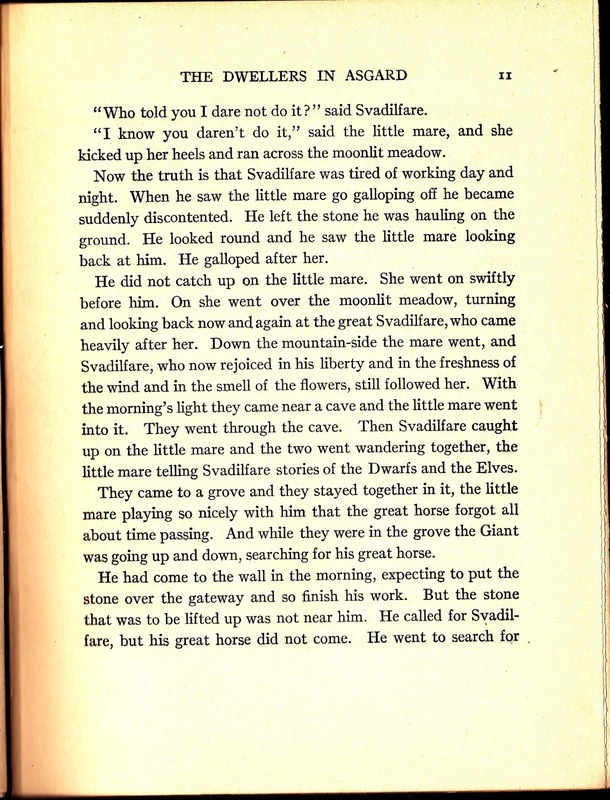 I teach storytelling, including a method called Word Weaving, developed by Kate Farrell, who discovered the power of storytelling while teaching Greek myths to bored high school students. She became angry and shouted out, "I WISH I WERE LIKE MEDUSA AND COULD TURN YOU ALL TO STONE!" Whoa! Her students thought she had flipped out, but they paid attention! For a modernized version, I enjoy school librarian and storyteller, Barbara MacBride-Smith's storytelling and also her book, Greek Myths, Western Style: Toga Tales With An Attitude, retelling those gods as a bunch of Texas "good ol' boys. . . and gals." 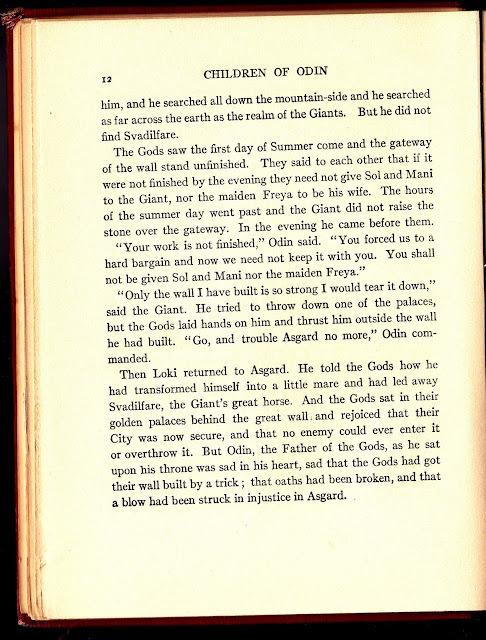 Have you noticed how Greek, to a lesser extent Roman, and even Egyptian mythology because of Egyptian history seem to get more attention than Norse or Celtic mythology? 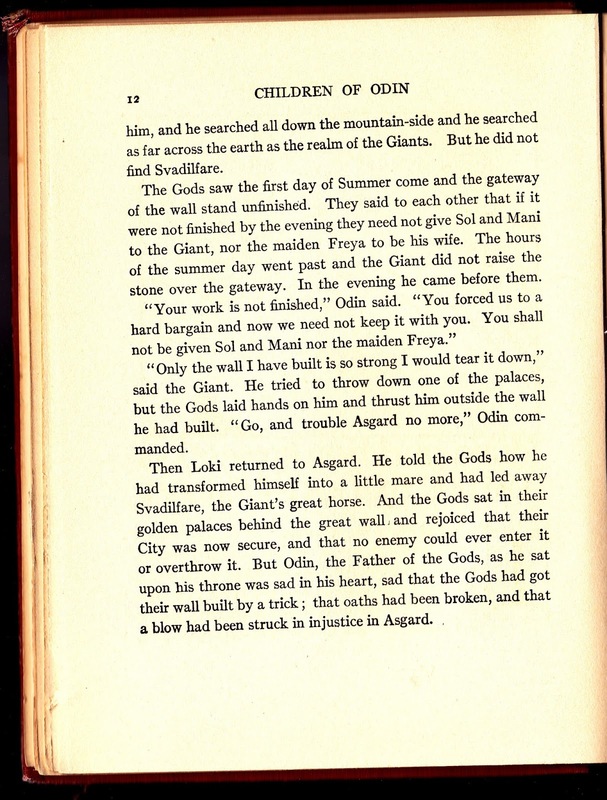 Padraic Colum, handled Norse mythology in great depth in The Children of Odin -- the source of today's tale. He also wrote a children's version of the Iliad and the Odyssey and many Celtic legends to retain his knowledge of Irish Gaelic. He's so well covered online, you may take your choice of his autobiographical sketch posted on The Baldwin Project and some of his writing there or the Wikipedia article about him and the various versions of some of his work at Project Gutenberg. 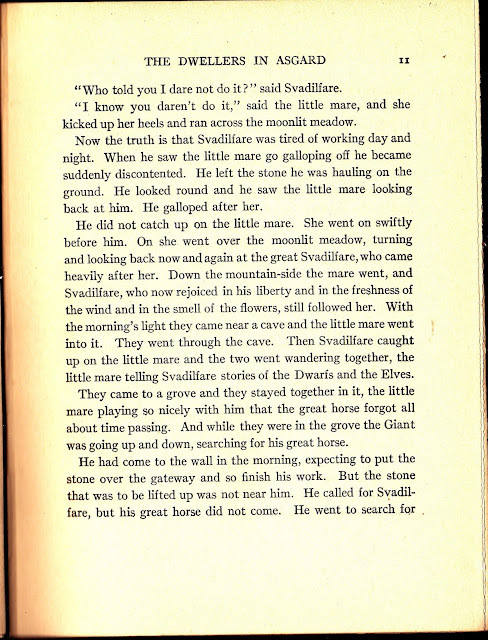 Taking stories exactly as they are in his book would require filling in background information. That's more easily done in a live re-telling. 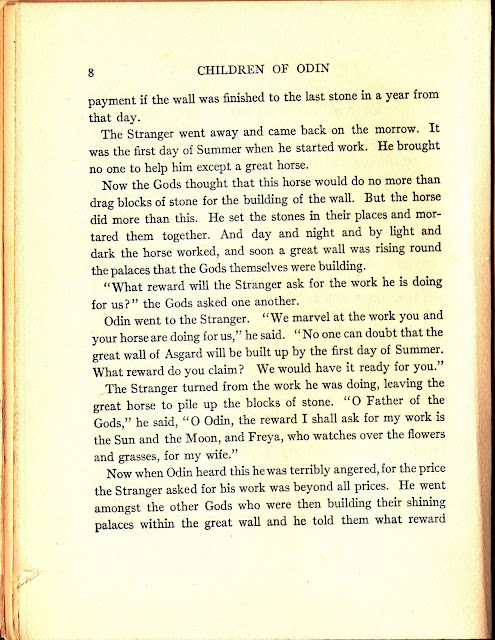 For that reason today's story is from almost the start of the book. 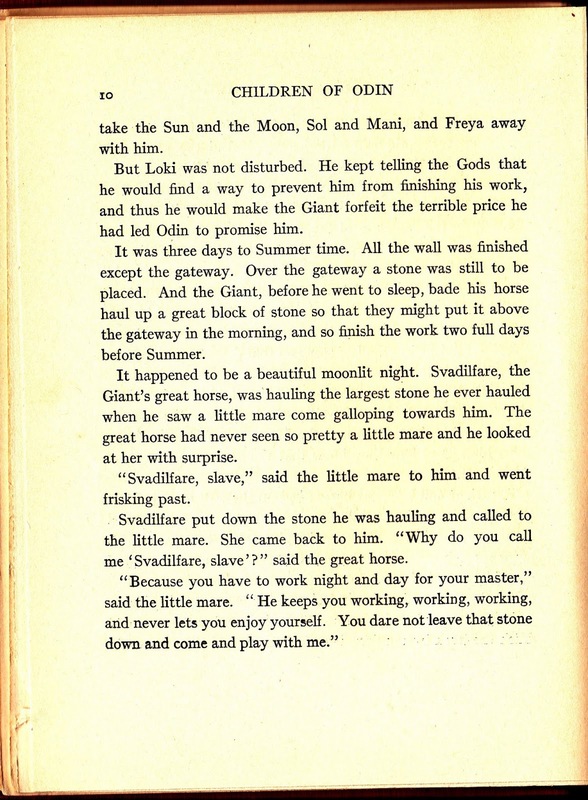 For example I'd love to include more about the trickster, Loki, who is in this story and throughout Norse mythology. That leaves things hanging, doesn't it? Just like a "soap", the stories always seem to leave you wanting more. 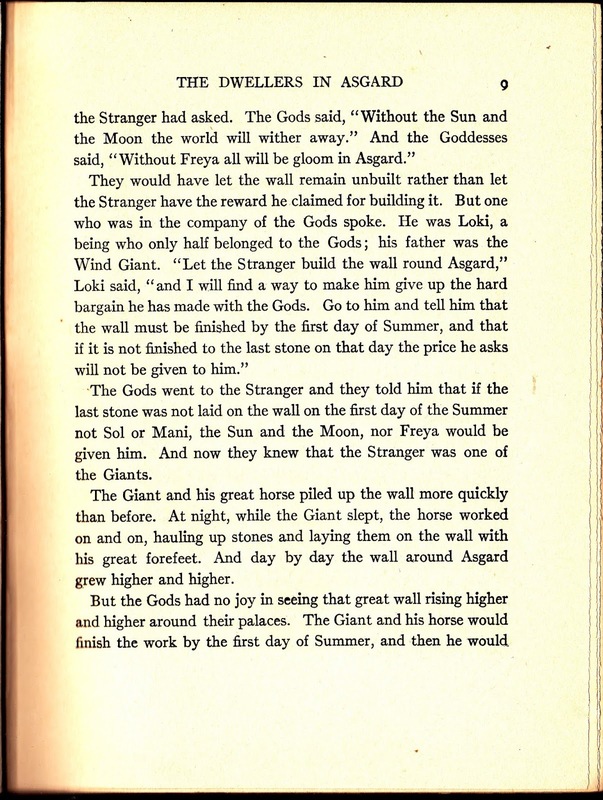 The next story takes place inside that wall in a garden where the goddess Iduna tended an apple tree whose apples kept the dwellers of Asgard from aging. 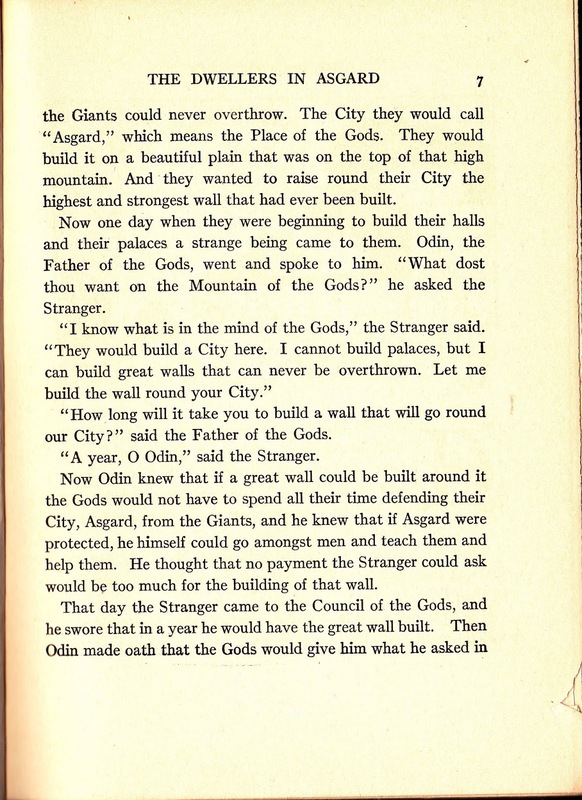 Odin and Loki went into the world of men, including the bleak realm of the Giants. 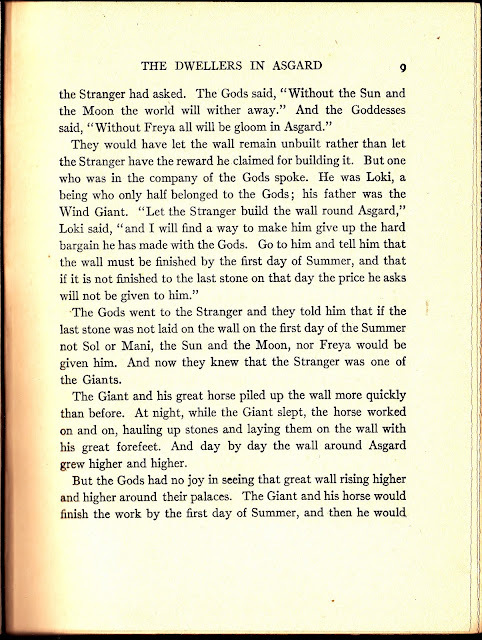 Revenge by the Giants, a barbecue, an iceberg, a volcano, and more trickery involving Loki, will that story slake the thirst for more? There are some stories by Colum put into a form of copyright limbo, but fortunately not the stories in The Children of Odin. 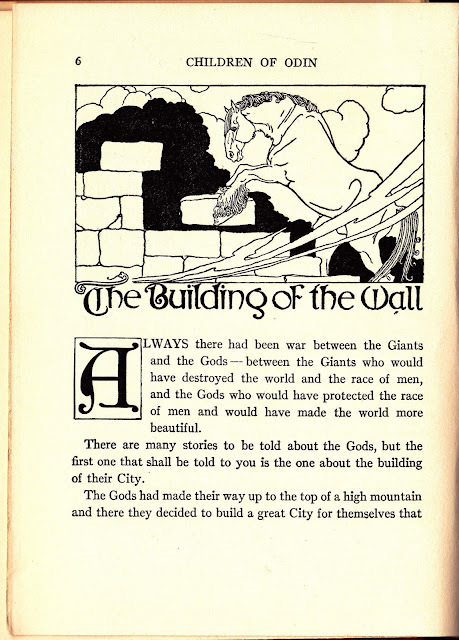 In my opinion stories are even more inclined to fit the slogan of Nobody Can Have Just One...nor should they, especially when they are part of our cultural heritage in the world of Public Domain.